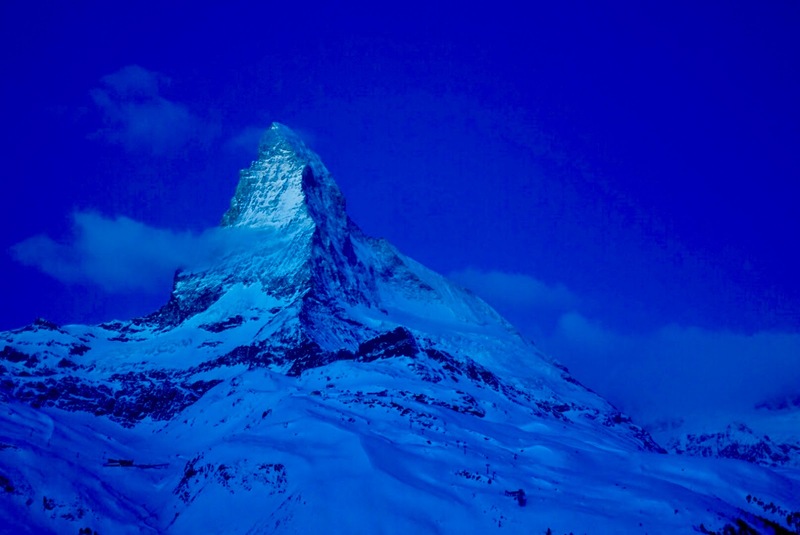 Matterhorn, the majestic mountain towering above the town. 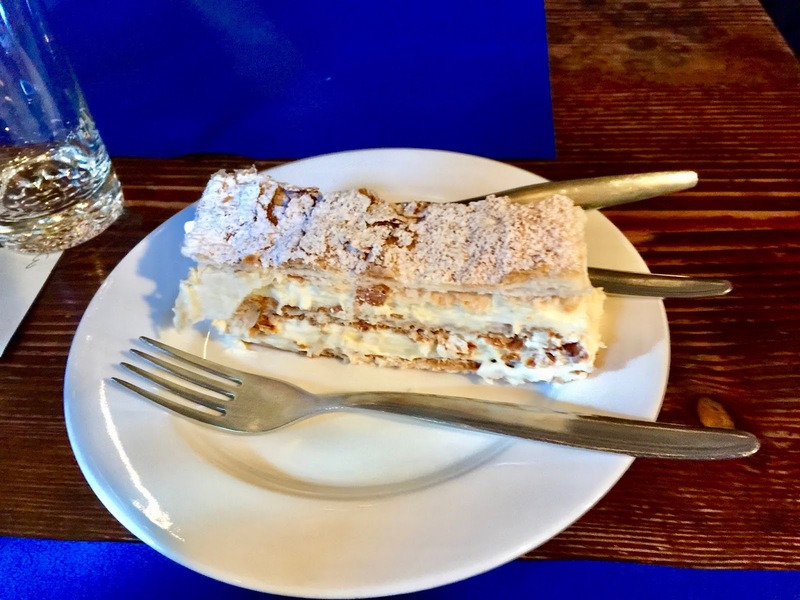 After having spent a week skiing here last year and trying out as many places for foodies on the slopes as possible I recently returned to this Alpine town for another seven days on the same mission. 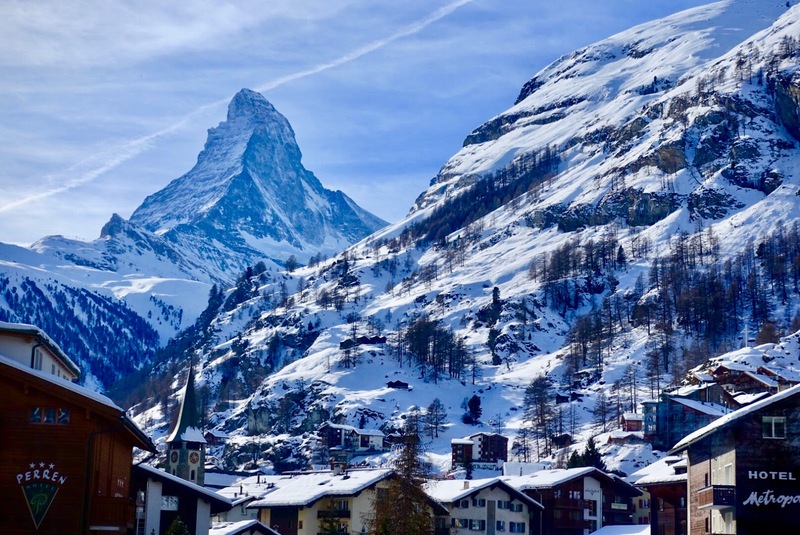 My first blogpost about Zermatt included a general overview of the skiing opportunities, details about a fabulous stay at one of the few ski-in, ski-out hotels onsite (Riffelalp Resort 2222m, highest luxury hotel in Europe) and a map covering a number of high-standard mountain huts alongside my judgement of four of them. 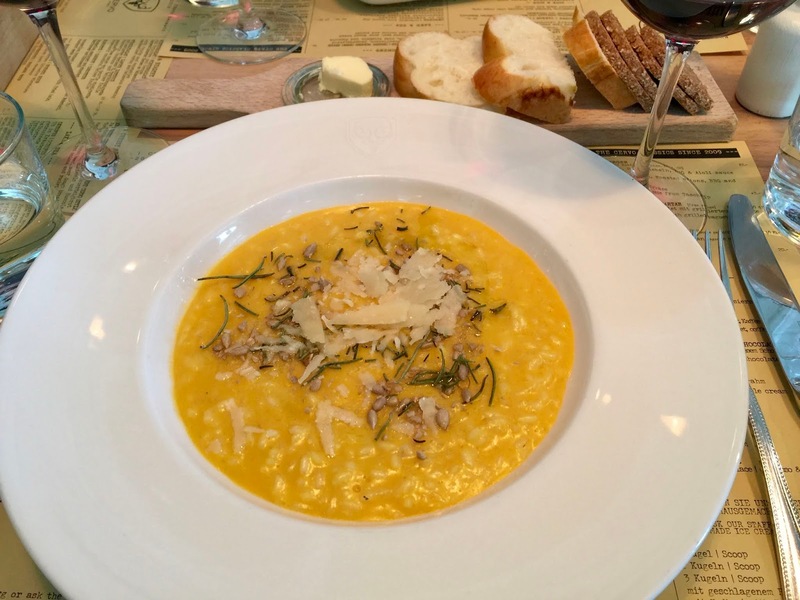 This time I want to focus on places for foodies on the slopes. 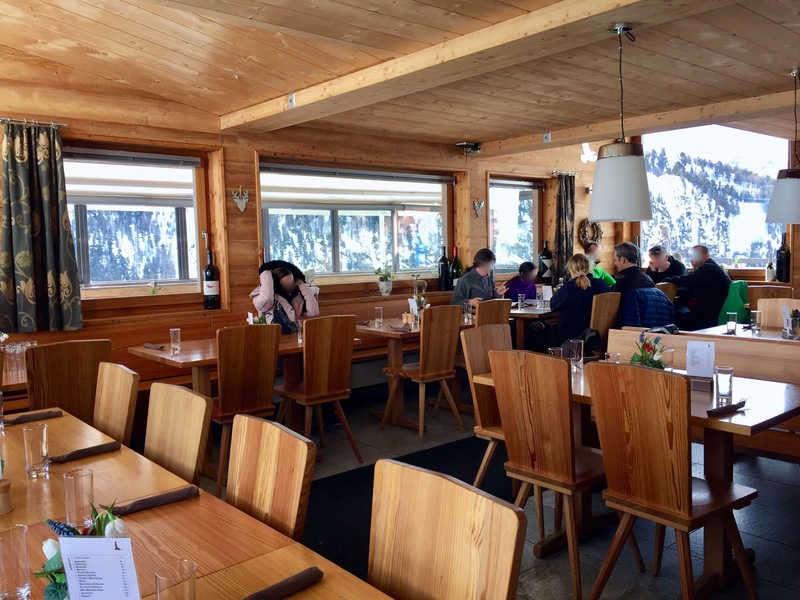 While I stayed at the same hotel and enjoyed my time here once again, I tried out more mountain restaurants and revisited others for the second time. As a result, I am now able to give insights on eight of them, all of them high quality establishments (no self service, no "ordinary" fare). Before going into individual places, you find my updated map with recommended mountain restaurants to go in Zermatt. It is based, amongst others, on information from a friend who is a connoisseur of the local food scene on the slopes. Please note that I have not visited yet all of them (it is stated in the description whether I have visited the restaurant in question or not). One point to start with, it is advisable to book ahead at all these restaurants. 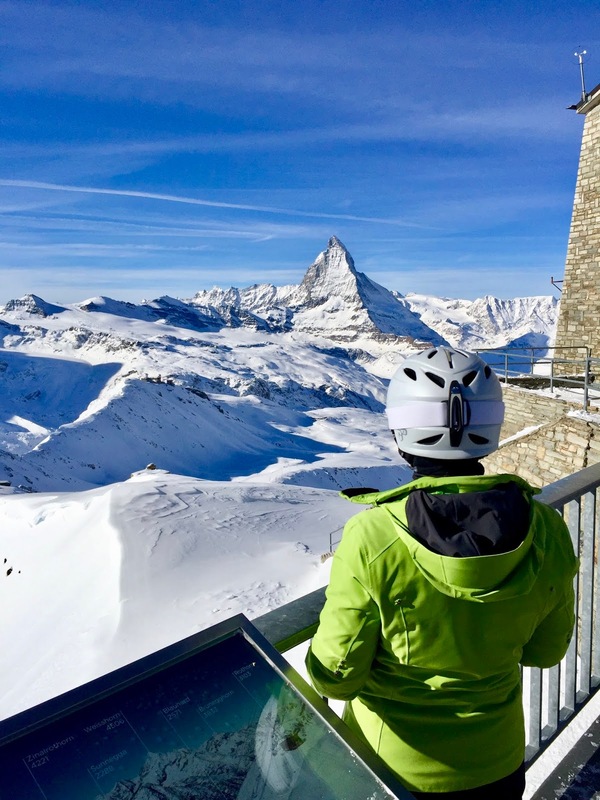 When I stayed in Zermatt in low season (end of January), it was sufficient to make reservations in the morning of the same day. 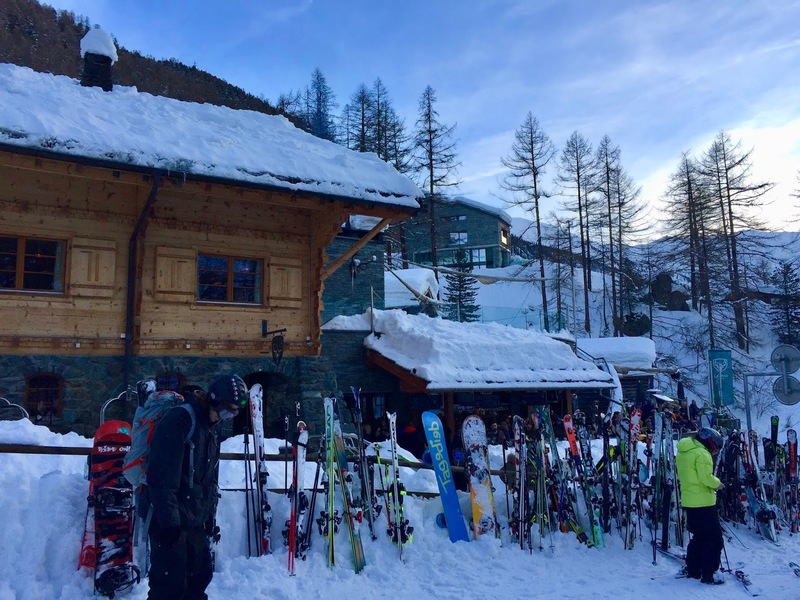 This is the perfect point of time to make such arrangements as you normally only know at this moment where you are going to ski at the day in question depending on weather forecasts and up-to-date information on lifts and cable cars operating. 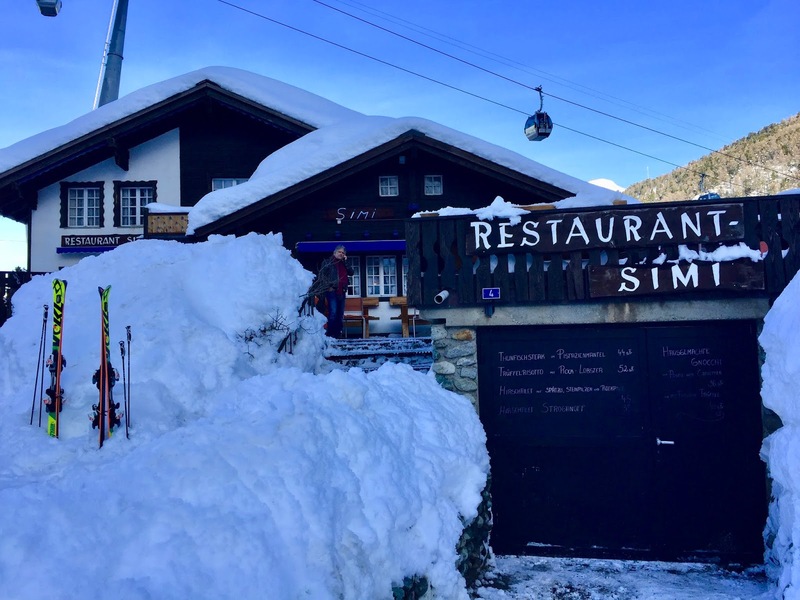 I will start with two mountain huts that I wanted to revisit because I was so much in favor of them last year, mountain restaurant Simi in the Furi area, and Chez Vroni in the Findeln area. I really wanted to have lunch here again as we had such a wonderful time at this restaurant on our last visit a year ago. 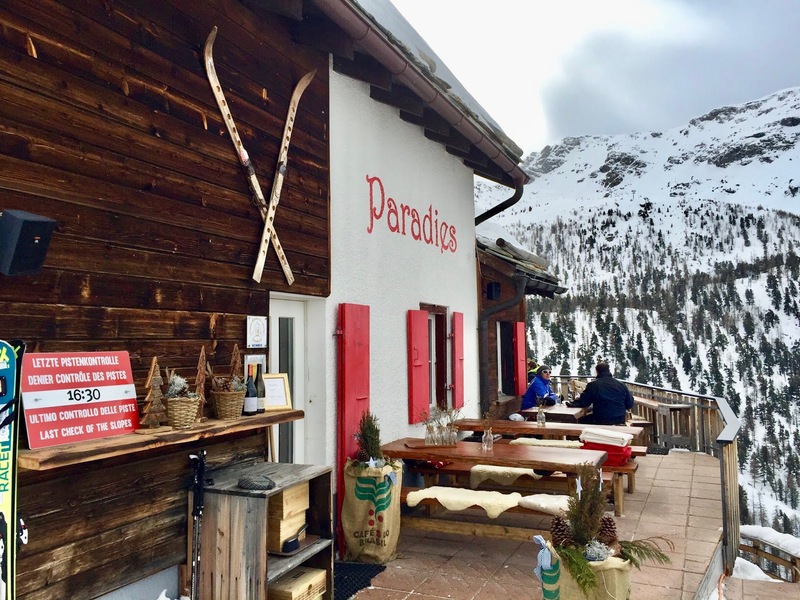 It is not your typical lunch spot on the slopes as it is not directly located next to the ski slope but a few steps away on a foot path near the Furi station. 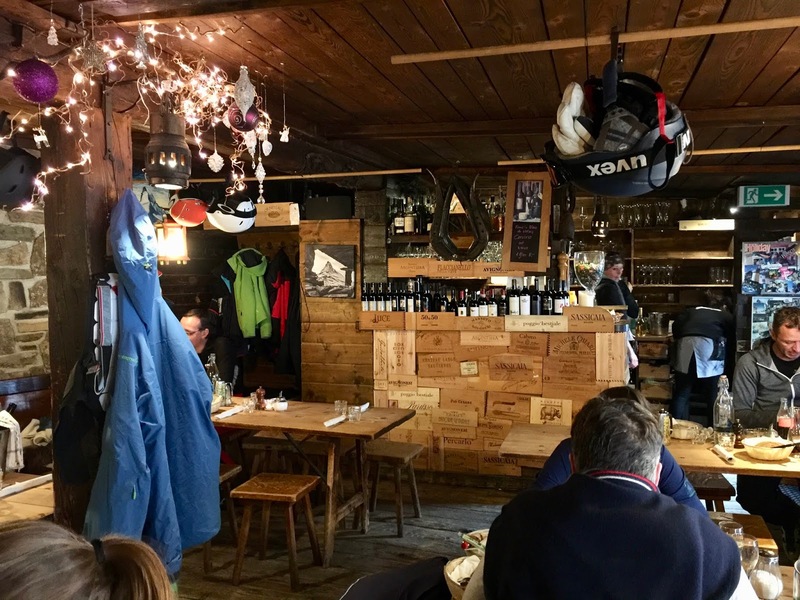 As a consequence of this setting, there are not many skiers having lunch here, which makes it a relaxed and quiet place – I hate to admit it, but the atmosphere in a typical ski hut is quite hectic and noisy. The place is run by two restaurateurs, Stefan Leitner and Sebastien di Stefano, who warmly welcome and care for their guests. It is a rustic styled restaurant, but you do not feel cramped in here, there is enough space to make you comfortable. While there is a wide choice of dishes available on the regular menu – from typical Swiss mountain fare as roesti (shredded roasted potatoes), cheese toast, sausage or cheese fondue to more refined meat dishes as calf’s liver or lamb chops –, our party of six (two families with an adult child each) ordered mainly from the daily specials, which often are tuna and gnocchi (some kind of dumplings). and we very much liked what we got! The tuna was the tastiest and most tender one I have had in a long time and the gnocchi were sublime, too. 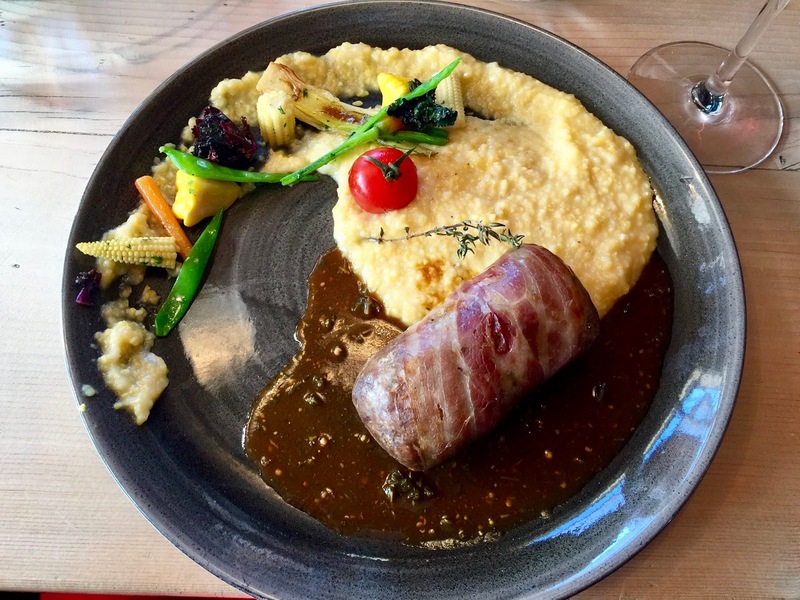 Prices here are not exactly inexpensive – eating out in Zermatt usually comes with a hefty price tag –, but competitive compared to other restaurants in the area and given the quality here. the professional and friendly service and of course the excellent cuisine! And also this year, Chez Vroni could convince our group of six. 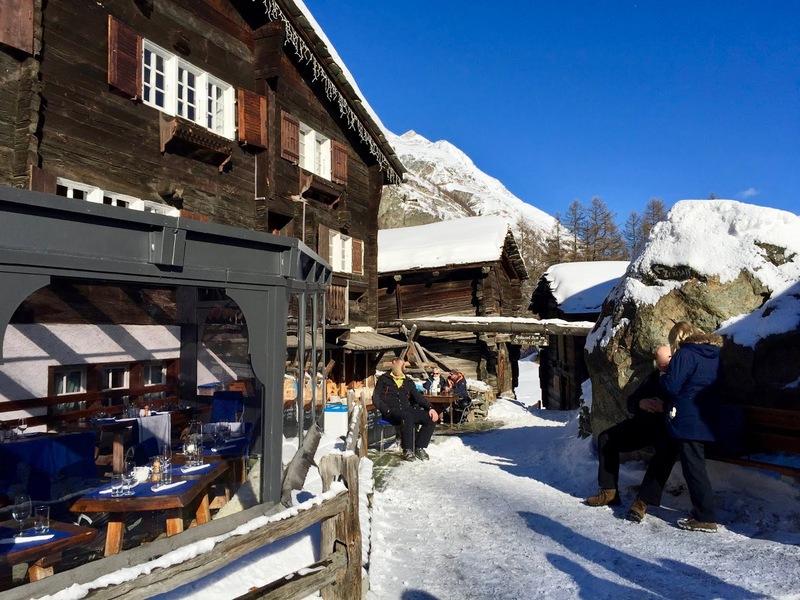 The restaurant is in the Findeln area right on the slopes and is by no doubt the hippest place in the Zermatt’ mountains! 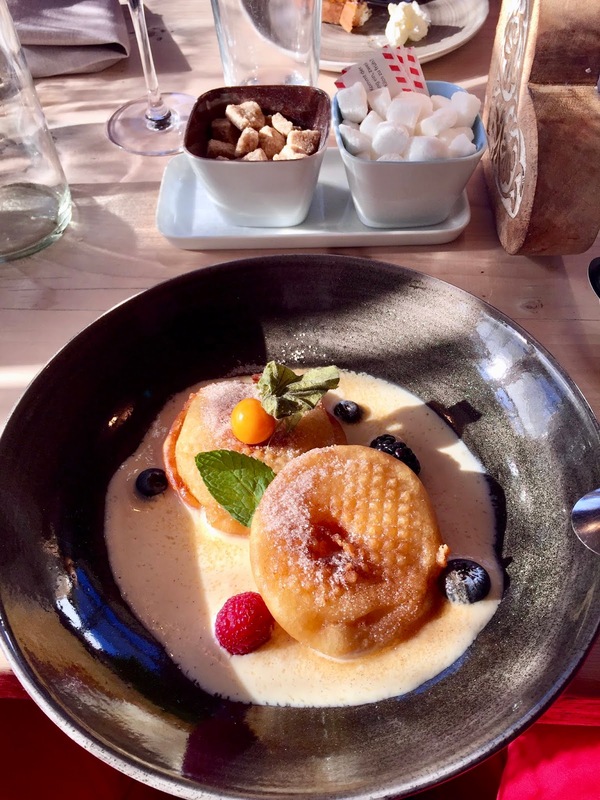 I was amazed to see how the original small farmhouse could have turned into a modern high-end gastronomy business! Not only the guest area but also the kitchen, of which I could catch a glimpse, are state-of-the-art. The eatery was awarded 14 Points Gault Millau and is Michelin listed. Everything here is perfectly organized. There is plenty of young, pretty and nice staff. When our group arrived at 12 o’clock it was not yet busy, and food arrived within fifteen minutes after ordering. Speaking of which, the menu is varied, from assorted cold cuts and cheese to exciting salads/soups as well as fancy pasta, meat and fish dishes. 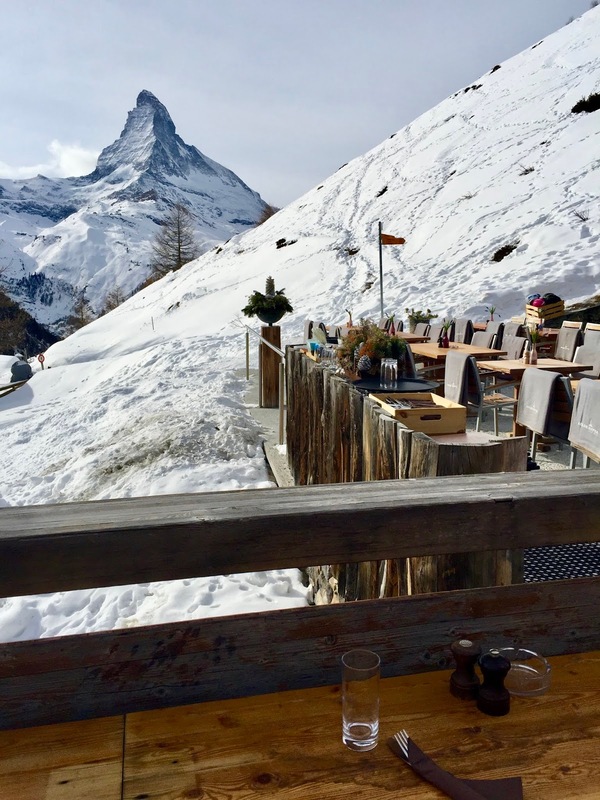 Prices seem OK for Zermatt standards – this Alpine town is not a place to expect moderately priced food. My husband and I chose an item from the classics section, meat loaf with an exquisite mustard thyme sauce, accompanied by polenta, everything locally sourced. 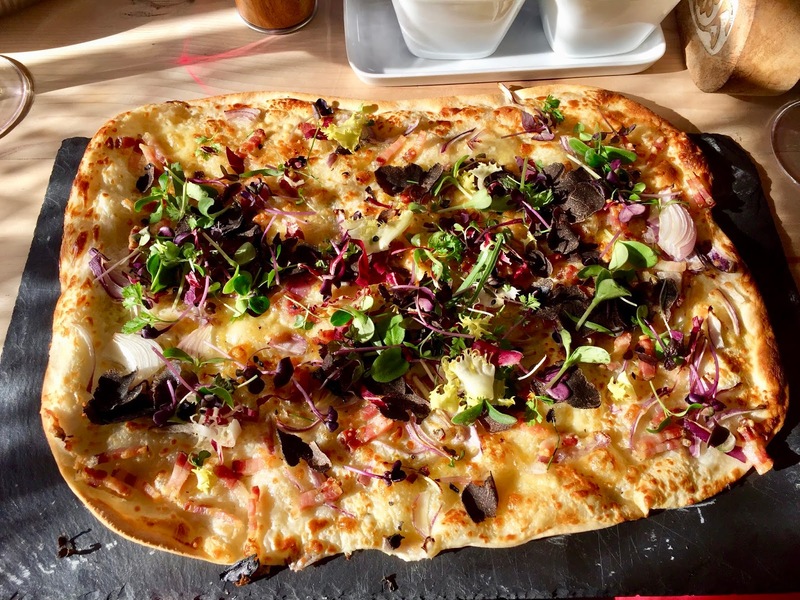 Our son had tarte flambée, topped with truffle, locally dried bacon, onions and herbs. and was raving about it! From the start to the end, a successful meal! Vrony Cotting-Julen, the owner, even came to the table after the main course and inquired whether we had enough or cared for a second helping! It is beyond question that we will return to Chez Vrony on our next visit to Zermatt. 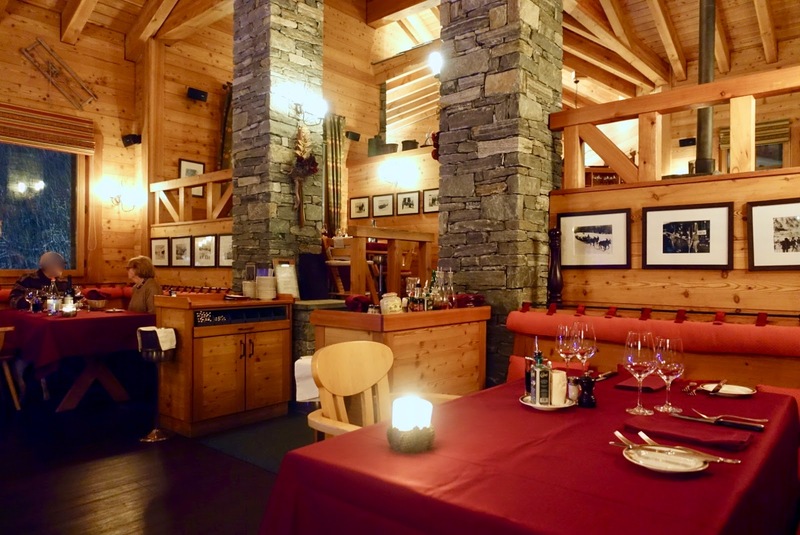 Another quality restaurant on the slopes is Ristorante Al Bosco in the Furi area, part of the Riffelalp Resort 2222m, the hotel, we had chosen for our Zermatt stay, and under the lead of Luigi Lafranco. While I have to admit that we never had lunch here as we were always on the move, it seems to be a popular lunch stop. However, we had dinner at the resort’s second restaurant (the main one is Restaurant Alexandre) this and the year before. 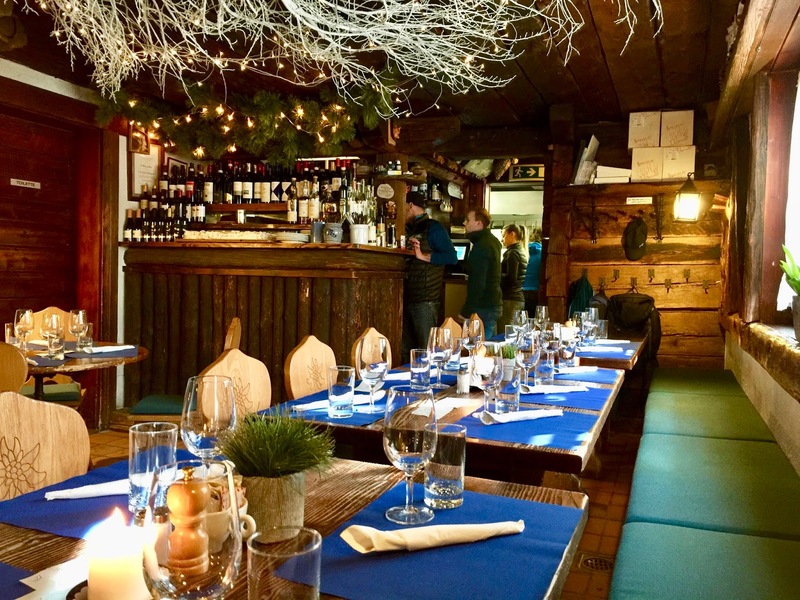 It features an Alpine theme decor as most other mountain restaurants in Zermatt, although it is more spacious than the typical one with high ceilings and big windows. meat, fish and of course Italian desserts. The place was awarded 13 Points Gault Millau. This restaurant in the Findeln area – awarded 14 Points Gault Millau, one point more than last year – was already on my last year’s list to go, but unfortunately we had not managed to eat here as the weather had been a bit difficult at the time to put it mildly. Be it as it may, Paradies was in any case the first place we had lunch during this year’s vacation to avoid being missed again! decorated in a traditional way but without being cramped or dark. Our party of seven (our son’s girlfriend joined us) was warmly welcomed and we were whisked away to two tables for four, lying next to each other by the window. When the question arises what to eat here, then there is only one answer, at least if you are a pasta lover, the homemade daily ravioli! On our inquiry we were told that the ravioli of the day were filled with fondue cheese. Almost all of us went for them and were thrilled by the choice. 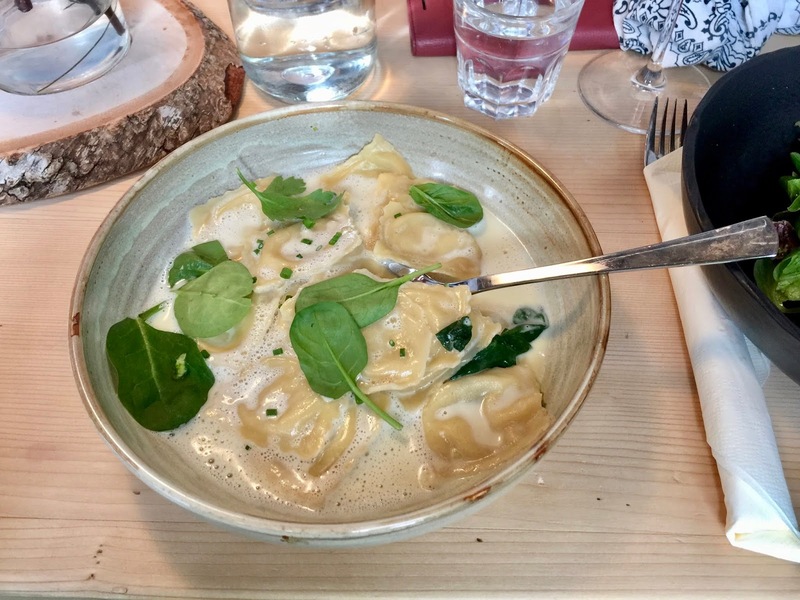 The filling was extremely tasty, the pasta dough very thin and the accompanying cream sauce was perfect, rich enough but not too much so, we relished it! 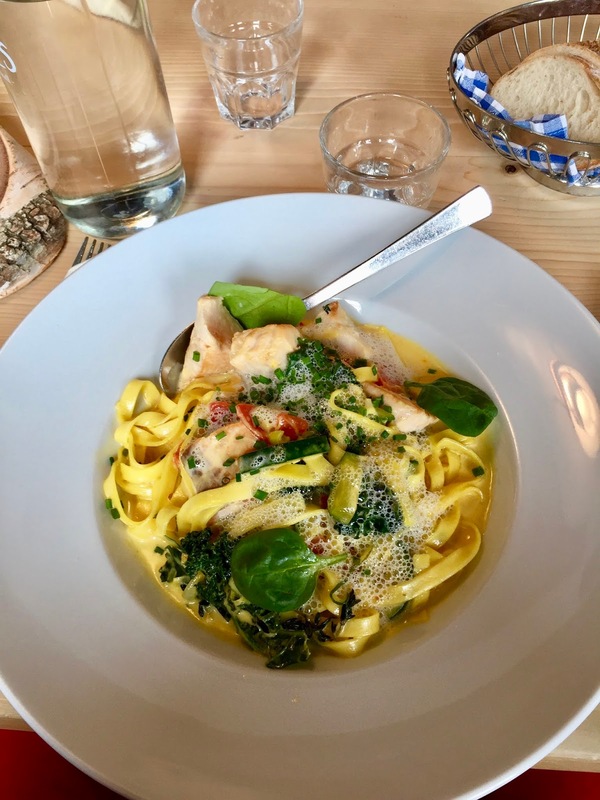 Also other dishes on the menu were convincing, for example tagliatelle "Mare" with salmon, local saffron, zucchini and cherry tomatoes. 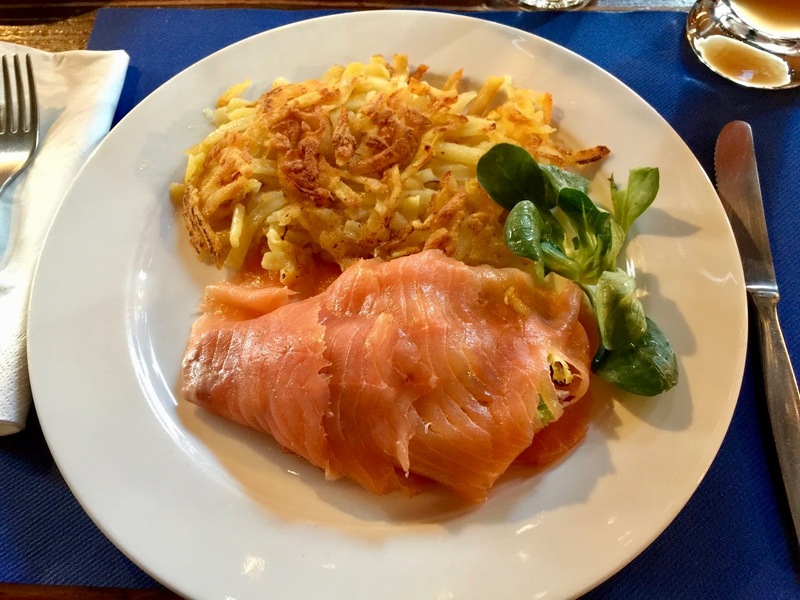 When it comes to the costs of the meal – no surprise, it is Zermatt – it does not come inexpensive, but it is OK for local standards! 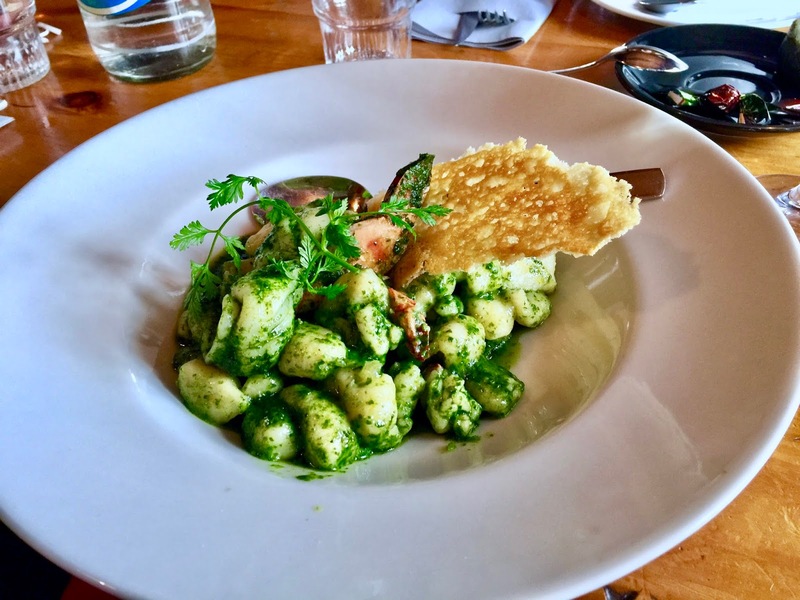 No question, we will be back to have more of this great homemade pasta! Gaston Zeiter, the chef here, is truly a “ravioli king”. We had lunch here also for the first time after being guests at a birthday party here some years ago in summertime. At the time we were lucky enough to enjoy a furious dinner at this restaurant awarded 14 Points Gault Millau and Michelin listed. The restaurant is about three quarters of the way down the mountain just below the Furi gondola right on the slopes. It is located amidst of a lovely hamlet with beautiful old buildings, I really love this setting! The best thing here is to sit outside as there are many great spots on the premises to have lunch. When we had lunch here, this was out of the question for us as it was too cold. So we went inside. It is a very cozy place, nicely furnished in a traditional way but it is also dark and cramped. Our party of seven only just managed to get all of us round the table! The food offer here is similar to others in the area, cold cuts, soups, salads, roesti/cheese dishes, pasta, dishes from land and sea. My husband and I opted for a roesti dish, a “Sunday”-version with smoked salmon and crème fraiche. It was solid yet not exceptional. My son who had pasta felt the same about his dish. In contrast, we absolutely loved the dessert, a vanilla slice, a house specialty. It is easily the best one I have ever tasted! Staff was nice enough, the price level as usual in Zermatt (rather high). I think we have to come back to give the restaurant a second chance to convince us of its true qualities. We have several friends who are constantly raving about this place and it might be possible that we caught them on a bad day. is maybe a tad less glamorous and the food a bit less sophisticated. Its interior is practically furnished and lacks the charm of other establishments I mention here in my overview. 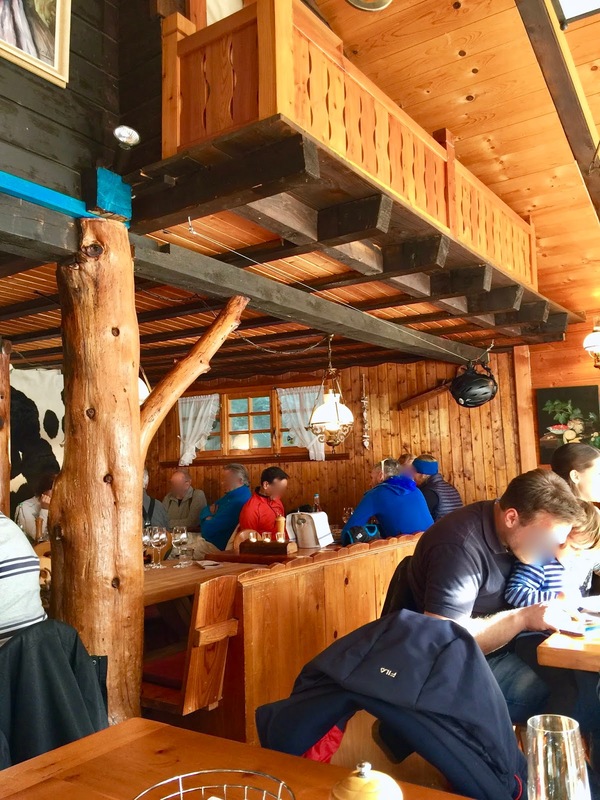 It is your typical restaurant on the slopes with square functional tables packed quite closely together. 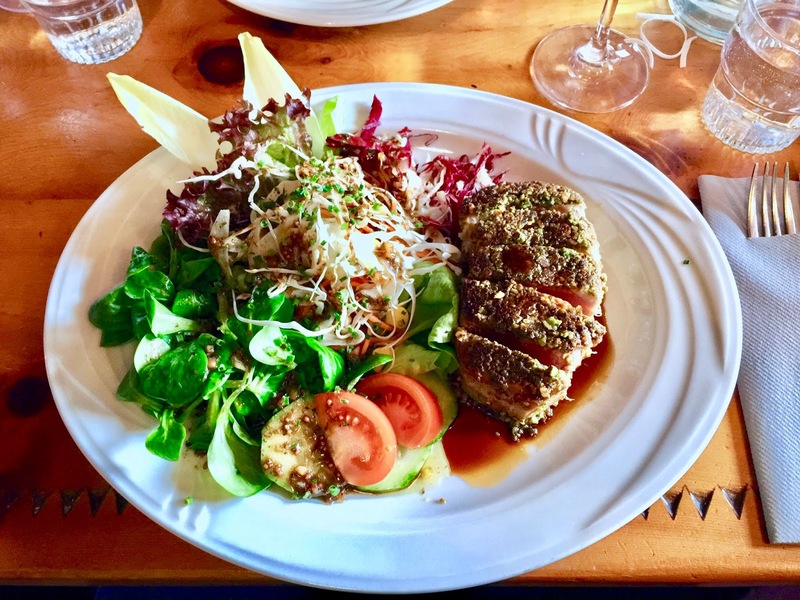 As to the menu and to the pricing, they are comparable to other mountain restaurants in Zermatt, albeit the choice is somewhat wider, the offer of meat dishes is not that varied and the one of proper fish dishes is practically non-existent. 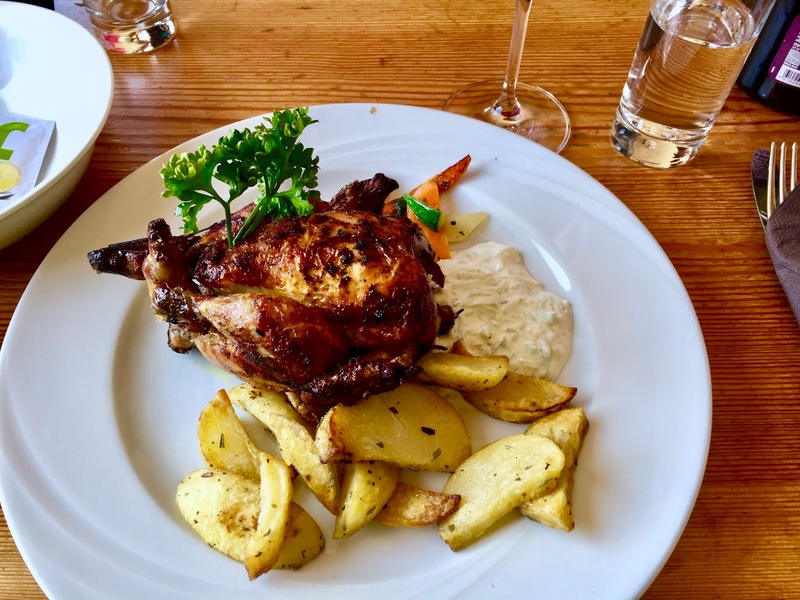 There is one thing that makes this eatery special, and this is its house specialty, delicious roast poussin from the outdoor grill. I was impressed by its great taste! 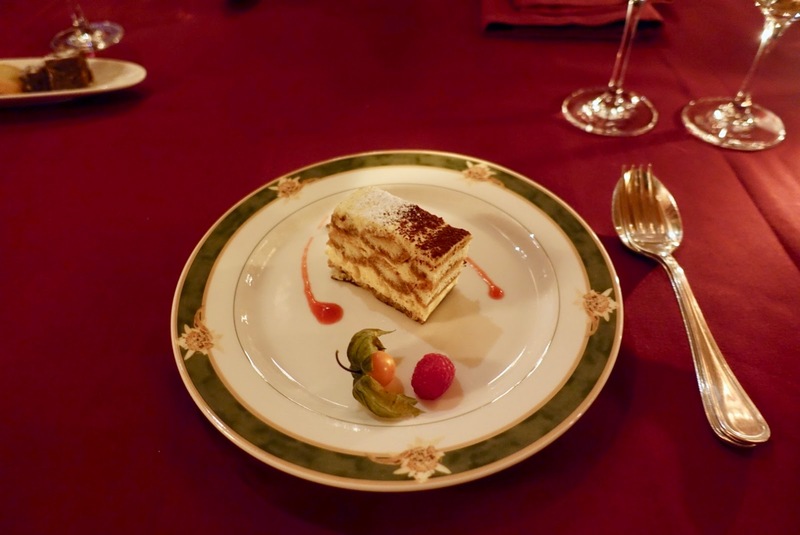 As I was told, also other dishes excelled just as tagliatelle with chicken strips in green curry sauce or the chestnut cake with plum compote! 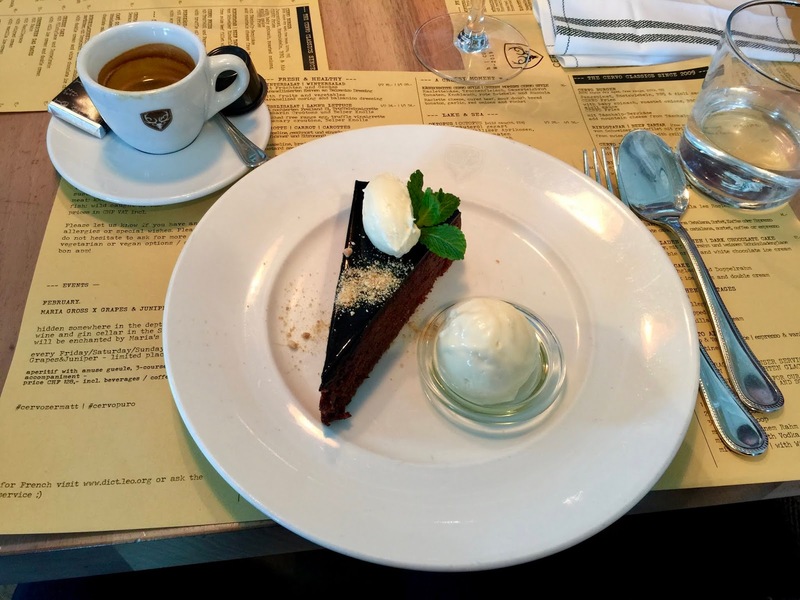 Staff here was kind and accommodative, service was quick and smooth, with one exception … The dessert – only one of us ordered one – took quite long to arrive, despite our reminders. 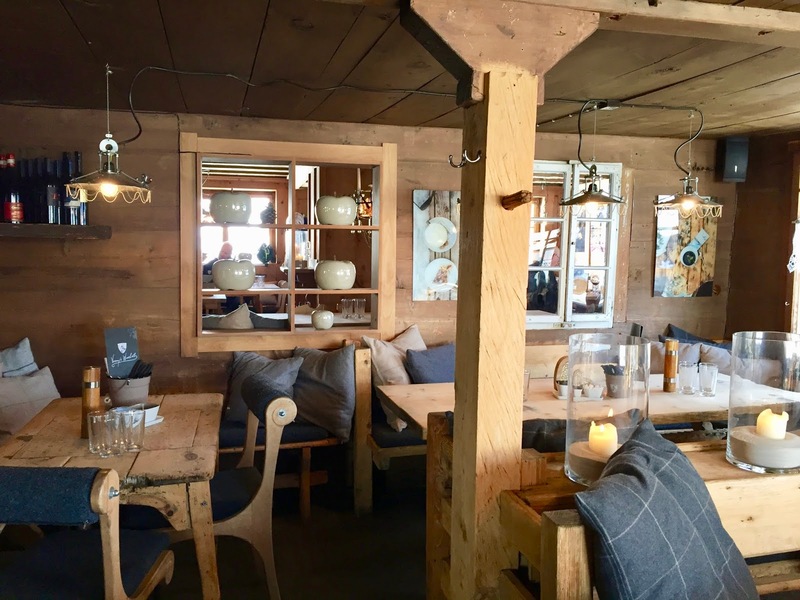 Overall, a restaurant on the slopes that makes you wish for more! 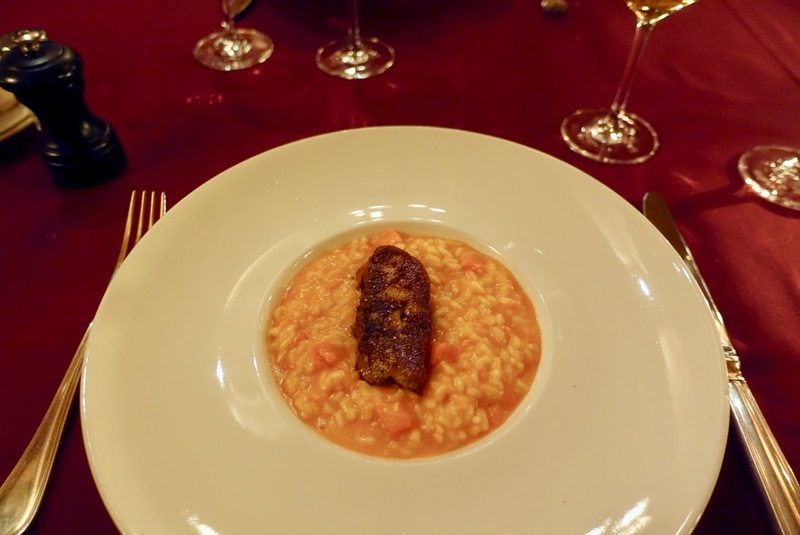 Another first-time experience was my visit to Cervo Puro, the signature restaurant of the luxury hotel Cervo, another ski-in/ski-out lodging – an alternative to “our” hotel, Riffelalp Resort 2222m, that we had also considered for our stay in Zermatt. 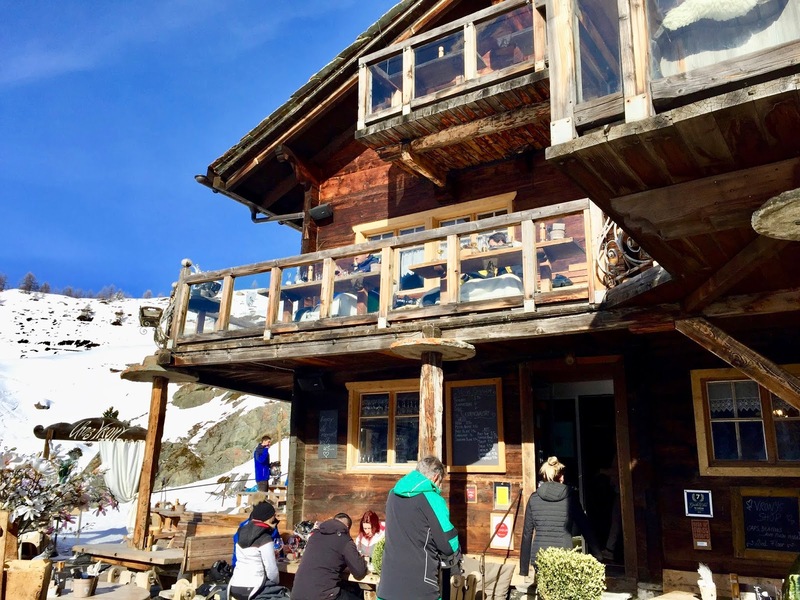 The resort is located at end of the Sunnegga slope and is very popular for its après ski bar. 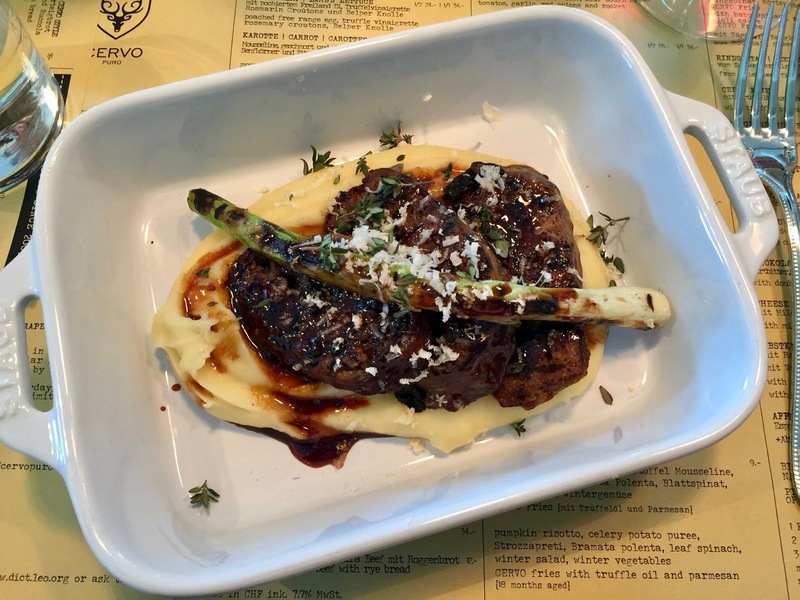 Restaurant Puro – there is also another eatery called Ferdinand serving cheese and barbecue dishes – offers a mix of Alpine and Italian food with a modern twist, awarded 14 Points Gault Millau and Michelin listed. The décor is also a mélange, on the one hand rustic with lots of wood and antlers on the wall, on the other hand modern with an unusual arrangement of lamps. Staff was friendly but seemed a bit stressed when the place filled up. As to prices, it has to be said that it is very expensive for what it is, even for Zermatt. The burger, for example, comes with a hefty price tag, 42 SFR! In conclusion, we generally liked what we got but I am not sure whether I will return. And last but not least to the fourth restaurant in the Findeln area, the one from Franz & Heidi, the amiable hosts. 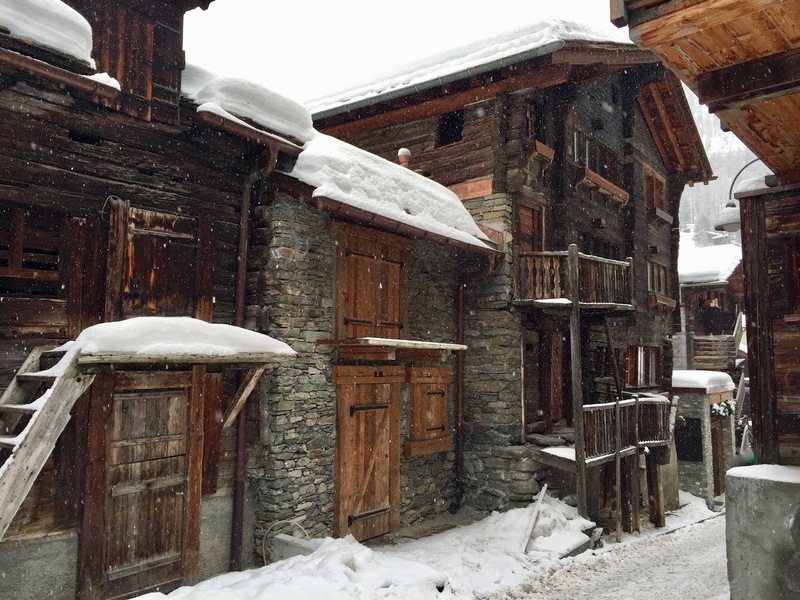 Although I did not make it to them this year, I have fond memories of my last year’s visit to this jewel of a mountain hut a bit away from the slopes – you have to take off your skis and walk down the hill through a cluster of houses. Once inside the traditional building – it is a bit cramped and dark –, you feel at ease in the cozy interiors. 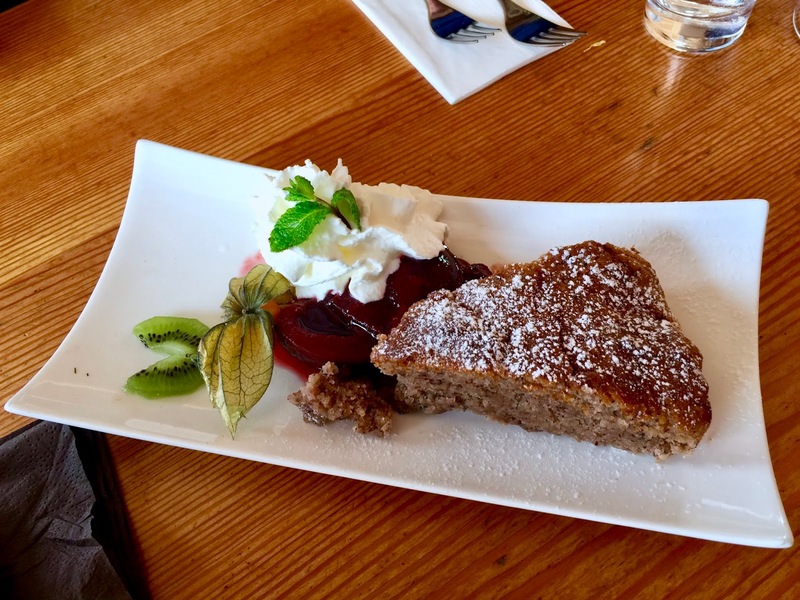 On offer here is a mix of traditional Swiss cuisine and Italian food with a twist, think of cheese and cold cuts, pasta, meat dishes and specialties like goose liver terrine, sashimi or beef tartare. 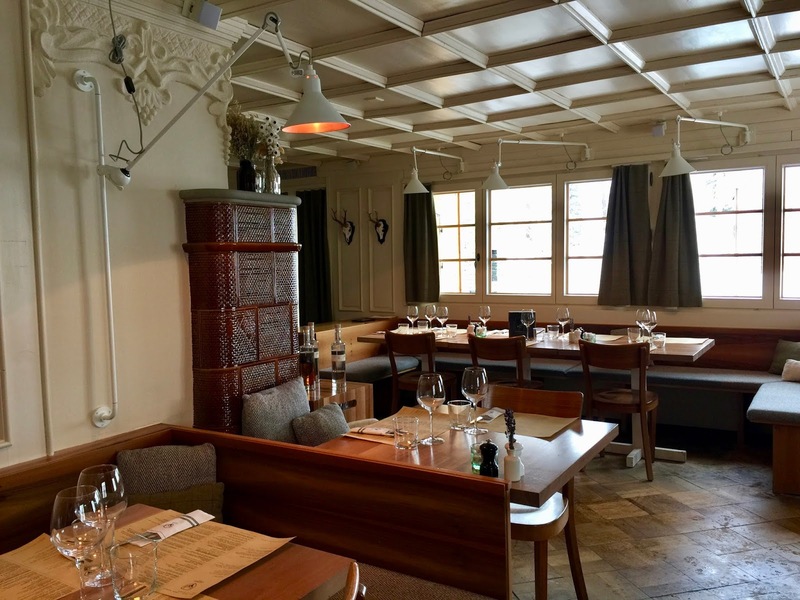 And as always in such Zermatt’s restaurants – Findlerhof is awarded 14 Points Gault Millau and Michelin listed – it is pricey but aligned with the quality provided. 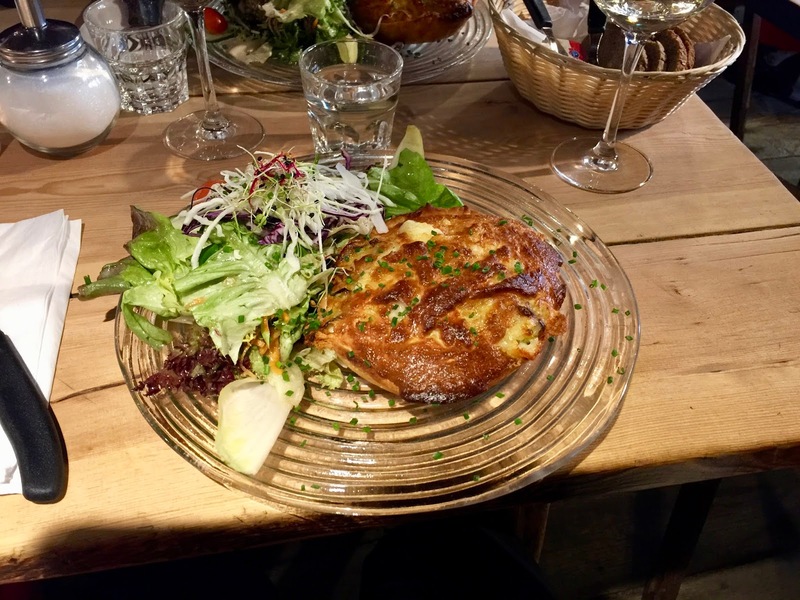 In terms of food, I wanted to try out a traditional dish that a friend of mine had recommended, Matterkuchen, a quiche with bacon, leek, onion, cheese accompanied by salad. And it was great, however more like a soufflé in a pastry. 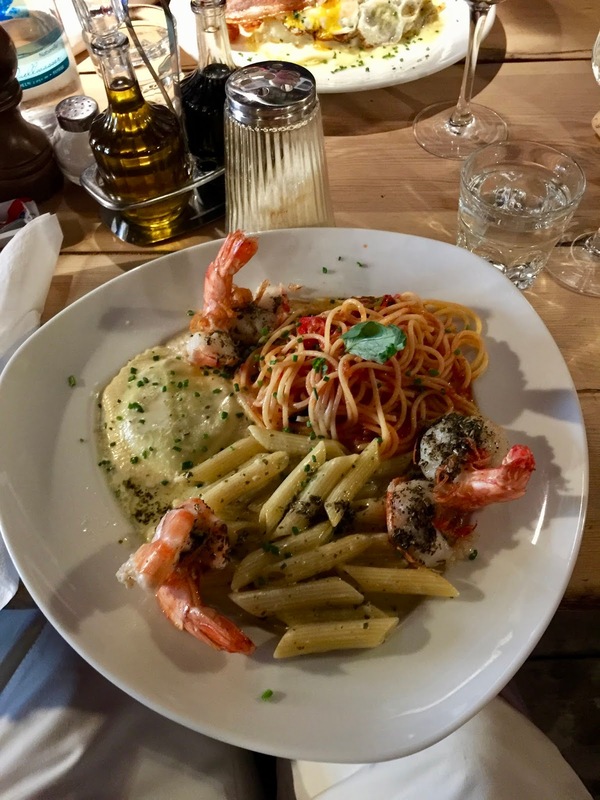 My son chose another of my friend’s favorite, Pasta mista “Trio”, three kind of pasta, that can be combined with scampi, what he did and was very much in favor of it! I am sure that Findlerhof will be on my list to go in any case when returning to Zermatt! 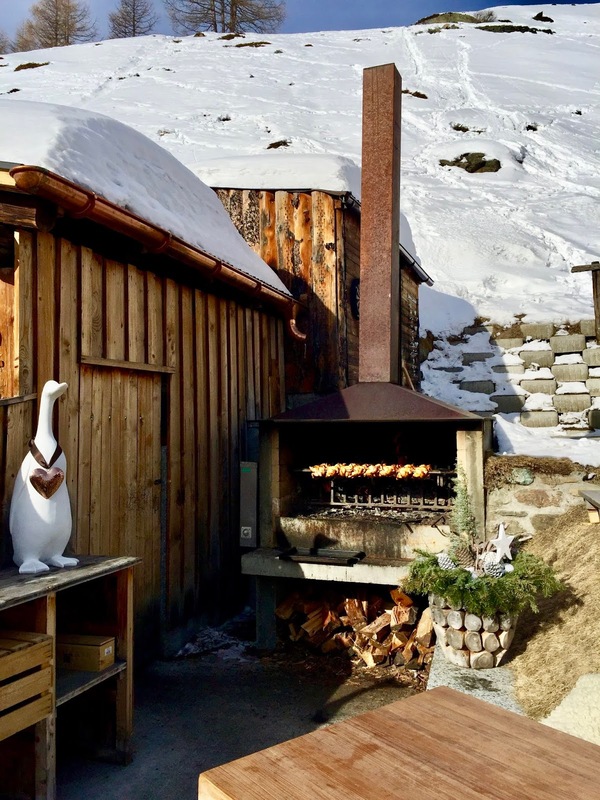 Apart from being one of world’s best and biggest ski resorts, Zermatt has a USP (a unique selling proposition for those who are not familiar with this marketing expression), and this is about its places for foodies on the slopes. There is most probably no other ski resort in Europe that has such an abundance of really good quality mountain huts. That said, they may look like typical restaurants on the slopes, but they are in fact gourmet havens. They are pricey as well but (mostly) totally worth it. All the eateries mentioned here are safe bets when it comes to the quality of food. Some places might be more rustic (aka cramped) than others or more expensive but they are all quality establishments. As often, it is also a question of taste which one suits you more or less. My favorites are – at least from today’s perspective – Simi and Chez Vroni, but this might change. 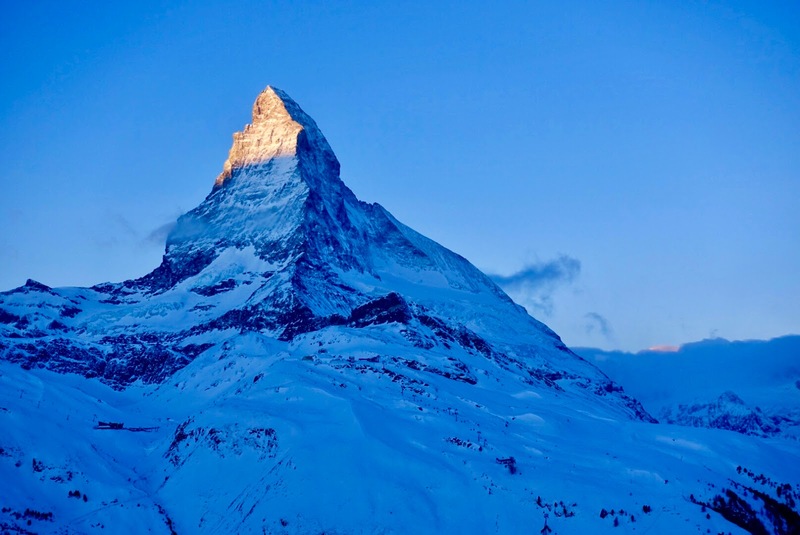 Come to think about it, I have just read an article about Stafelalp, another ski hut in Zermatt, which sounds promising. Has anyone been there lately and cares about commenting it? 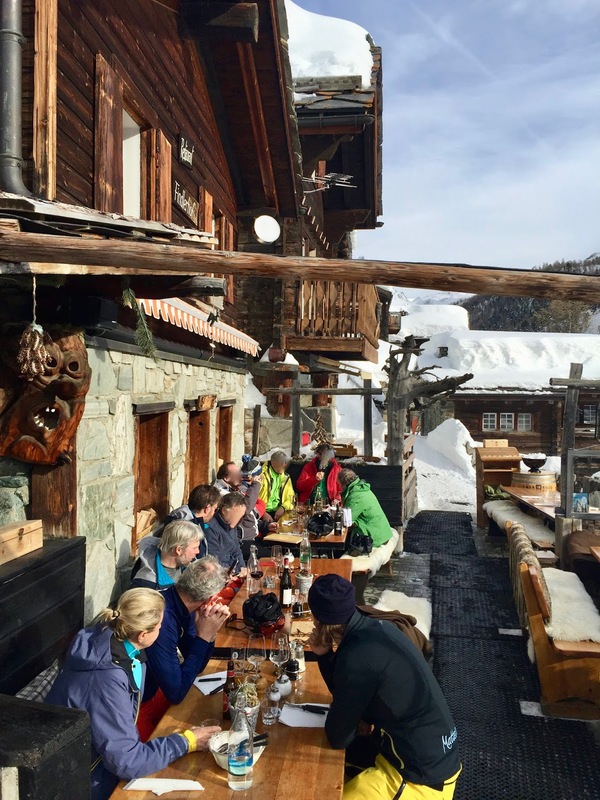 Are there any other recommended restaurants on the slopes in Zermatt to have lunch in style that I have to try out?